McBASTARD'S MAUSOLEUM: Own Blade Runner 2049 on 4K Ultra HD Blu-ray combo pack, 3D combo pack, Blu-ray combo pack and DVD on January 16th, or Own It Early on Digital HD on December 26! Own Blade Runner 2049 on 4K Ultra HD Blu-ray combo pack, 3D combo pack, Blu-ray combo pack and DVD on January 16th, or Own It Early on Digital HD on December 26! Burbank, CA, December 7, 2017 – See what critics are calling “the best movie of the year” when “Blade Runner 2049” arrives onto 4K Ultra HD Blu-ray Combo Pack, Blu-ray 3D Combo Pack, Blu-ray Combo Pack, DVD and Digital HD. From Oscar-nominated director Denis Villeneuve (“Arrival”) comes Alcon Entertainment’s science fiction thriller “Blade Runner 2049.” Sure as it is to delight ‘Blade Runner’ fans, this stunningly elegant follow-up doesn’t depend on having seen the original. 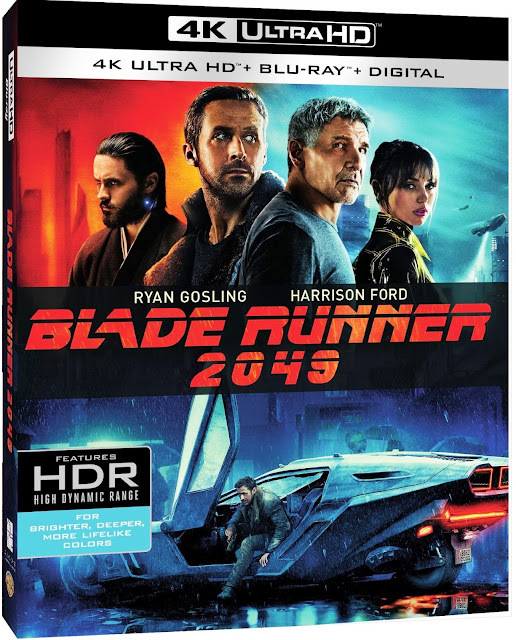 “Blade Runner 2049” will be available on 4K Ultra HD Blu-ray Combo Pack for $44.95, Blu-ray 3D Combo Pack for $44.95, Blu-ray Combo Pack for $35.99 and DVD for $28.98. The 4K Ultra HD Blu-ray Combo Pack features an Ultra HD Blu-ray disc with the theatrical version in 4K with HDR and a Blu-ray disc also featuring the theatrical version. The Blu-ray 3D Combo Pack features the theatrical version of the film in 3D hi-definition, hi-definition and standard definition; the Blu-ray Combo Pack features the theatrical version of the film in hi-definition on Blu-ray; and the DVD features the theatrical version in standard definition. The Blu-ray 3D Combo Pack and Blu-ray Combo Pack include a digital version of the movie in Digital HD with UltraViolet. Fans can also own “Blade Runner 2049” via purchase from digital retailers beginning December 26th. Additionally, all of the special features, including interviews with filmmakers, featurettes, and deleted scenes, can be experienced in an entirely new, dynamic and immersive manner on tablets and mobile phones using the Warner Bros. Movies All Access App, available for both iOS and Android devices. When a Combo Pack is purchased and the digital movie is redeemed, or the digital movie is purchased from a digital retailer, the Warner Bros. Movies All Access App allows users to watch the movie and simultaneously experience synchronized content related to any scene, simply by rotating their device. Synchronized content is presented on the same screen while the movie is playing, thus enabling users to quickly learn more about any scene, such as actor biographies, scene locations, fun trivia, or image galleries. Also, users can share movie clips with friends on social media and experience other immersive content. The Movies All Access app is available for download on the iTunes App Store and Google Play Store. The Blu-ray discs of “Blade Runner 2049” will feature a Dolby Atmos® soundtrack remixed specifically for the home theater environment to place and move audio anywhere in the room, including overhead. To experience Dolby Atmos at home, a Dolby Atmos enabled AV receiver and additional speakers are required, or a Dolby Atmos enabled sound bar; however, Dolby Atmos soundtracks are also fully backward compatible with traditional audio configurations and legacy home entertainment equipment. “Blade Runner 2049” will also be available on Movies Anywhere. Using the free Movies Anywhere app and website, consumers can access all their eligible movies by connecting their Movies Anywhere account with their participating digital retailer accounts. On Dec 26, “Blade Runner 2049” will be available to own for streaming and download to watch anywhere in high definition and standard definition on favorite devices from select digital retailers including Amazon, iTunes, PlayStation, Vudu, Xbox and others. On January 16, “Blade Runner 2049” will be made available digitally on Video On Demand services from cable and satellite providers, and on select gaming consoles.